"G7 regards the aggression against Ukraine as the aggression against the entire civilised world." The Group of Seven leading industrialised nations (G7) agreed to join forces to help Ukraine oppose the Russian aggression. Ukrainian Foreign Minister Pavlo Klimkin said this following the special session of the G7 Foreign Ministers’ Summit. "The main result is that they [G7 countries] regard the aggression against Ukraine as the aggression against the entire civilised world. All the participants stated this very clearly. We also agreed to join forces to repel this aggression," Klimkin said. 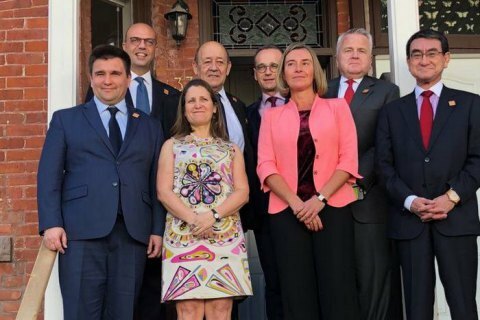 G7 foreign ministers understand that Russia will continue to destabilise Ukraine, so assistance to Ukraine is crucial for all the G7 countries, the Ukrainian foreign minister noted. The parties also discussed the assistance of G7 countries in reforming Ukraine. "We agreed to think about some formats, how to increase the role of G7 in repelling these threats and in further facilitating the reforms. I cannot disclose some ideas as they are under consideration of the [G7] presidency, but I think they will be promoted in a couple of months," Klimkin added. Klimkin is on a visit to Toronto, where he has already met with foreign ministers of G7 countries and held bilateral meetings with the foreign ministers of Germany and the United Kingdom and acting secretary of state.